2.25 mm. / 2.1 mm. 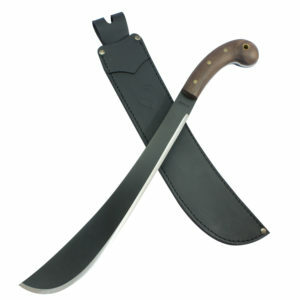 This is a perfectly balanced machete for work in the woods. Don’t waste money on more expensive machetes. This is a true workhorse and if taken care of will last a long time. Just wish there was a kydex or other non-fabric belt sheath, slide-in style, available for it. Very nice balanced feel, light but heavy enough to chop hard. The blade is plenty thick and stiff at the end. 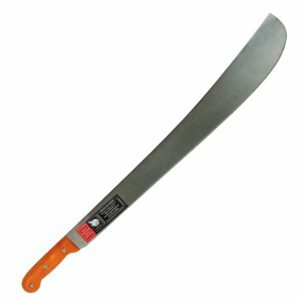 A solid cheap machete. Truly a workhorse and the the staple machete of most cane hands in far north Queensland Australia. If your willing to put 15 to 20 minutes into sharpening a convex edge into this machete, with a light oil it will last you years. Another great thing is the handle is not perfectly tapered to the spine of the blade and is not filled with resin, this again allows further shaving or sending to form that perfect grip. Would recommend and I use it frequently. 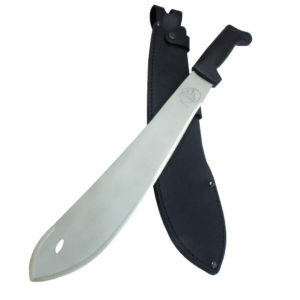 This is an excellent machete, the steel is very high quality and takes a razor sharp edge. I modified mine by drilling a hole for a lanyard, needed a diamond tile drilling bit to bore through the metal. I Epoxied a 6mm copper tube in the landed hole , it’s perfect. It is fantastic for processing very large catfish, opening coconuts and making cordage. I modified the handle with a rasp and sand paper to thin it out and smooth edges. I filed down the bevel angle so the blade never wedged into anything I cut . I sharpened it on my paper wheel to blistering sharpness , made a cardboard and gaffa tape sheath for it. This machete modified and sharpened properly together with a high quality mosquito net, sets you up ready to be air dropped into hell, trust me I’ve been there. Cuts like it should, easy to resharpen, overall a great tool.